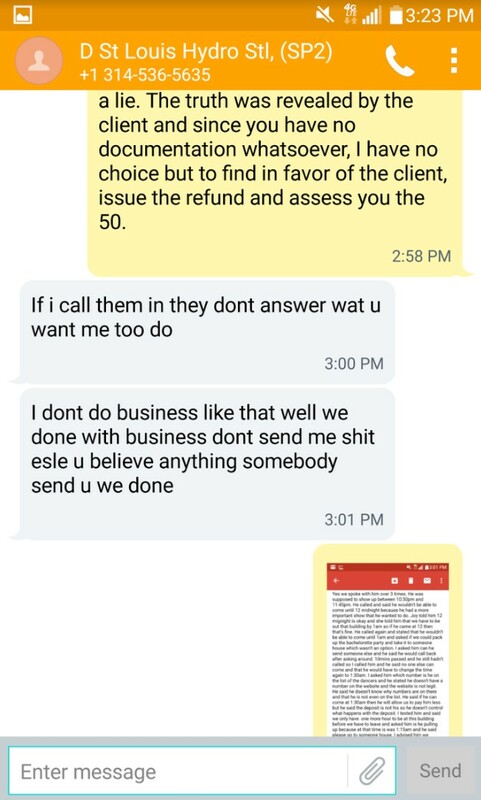 On 9-22-17 at approximately 2:54 PM, an Omen Agent and the below listed individual, (Darnell Watkins aka Hydro aka KingHydro) engaged in a text exchange regarding business. 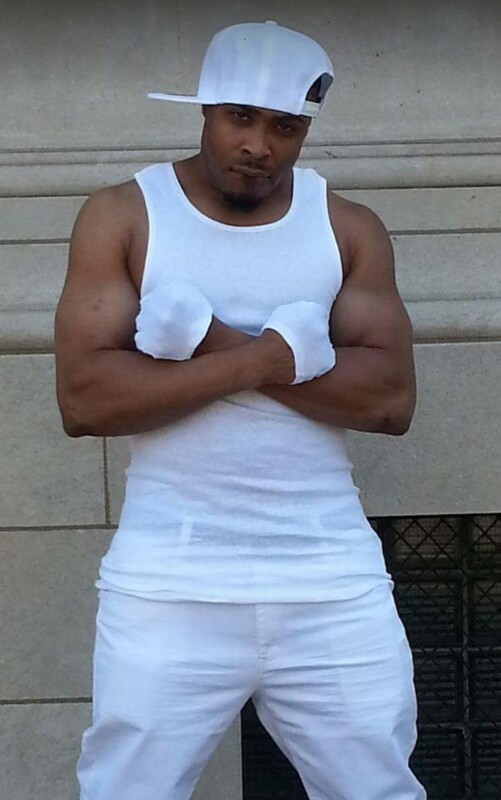 Once Darnell learned he was being held accountable for his poor business practices, he became hostile. Police are being contacted to persue charges. Darnell later attempted defame the company reputation online. Company may seek civil damages if he persists. 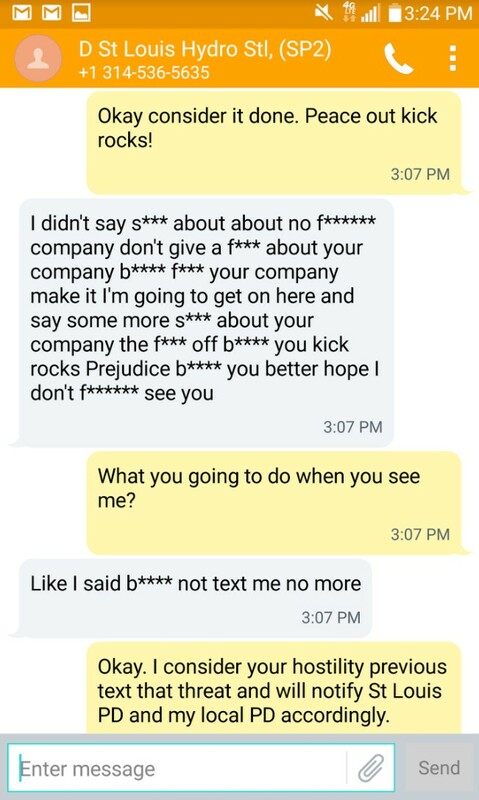 See screenshots of the exchange below as an example of how he has and may conduct business. CLIENT: I have not received the deposit back yet. May I have an update? AGENT: The entertainer tried contacting you and Joy prior to his arrival but got no answer or response. Because of this he departed and you forfeited your deposit. 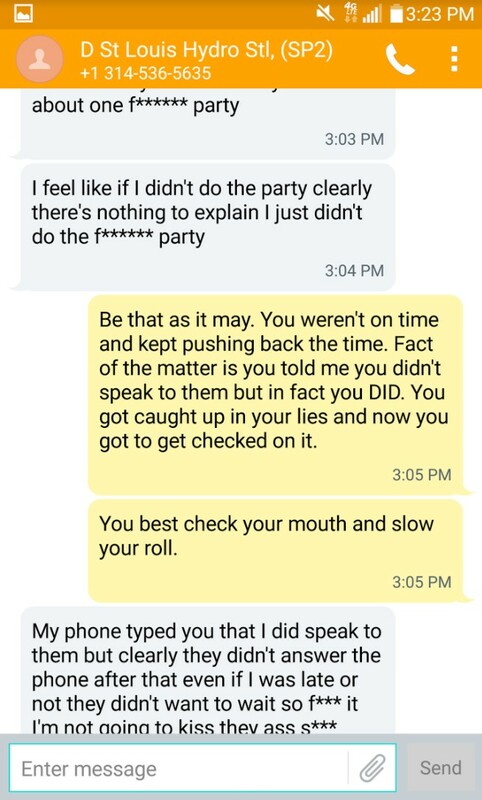 You and Joy were both notified of this via text on the night of your party. 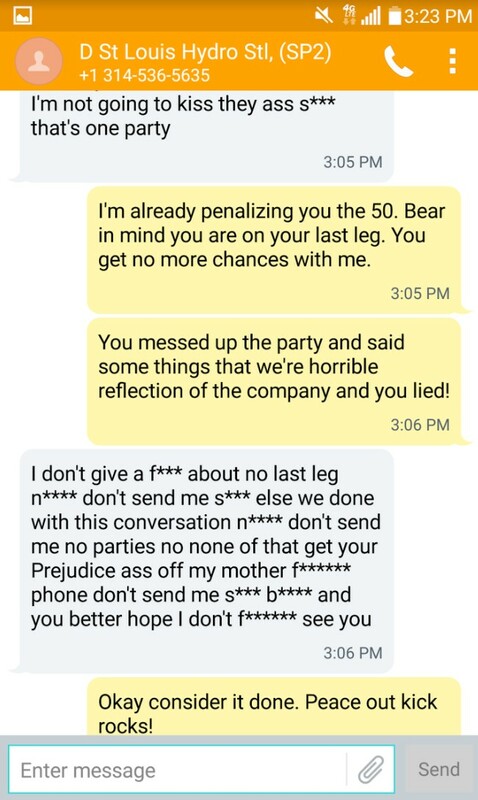 CLIENT: If you like I can send you screen shots of the messages between the dancer and I. I can also send you screen shots of the calls with the dancer so you can see what time we spoke with the dancer and for how long. I have proof that the dancer didn’t show up and his telephone number. He said his name was Hydro as well which he wasn’t on the website at all. AGENT: So you did speak to him? What happened when you spoke to him and what did you speak about? CLIENT: Yes we spoke with him over 3 times. 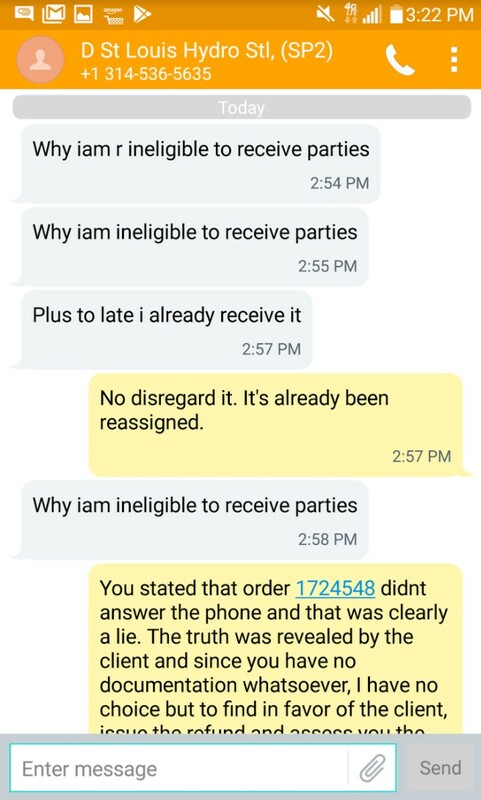 He was supposed to show up between 10:30pm and 11:45pm. He called and said he wouldn’t be able to come until 12 midnight because he had a more important show that he wanted to do. Joy told him 12 mignight is okay and she told him that we have to be out that building by 1am so if he came at 12 then that’s fine. 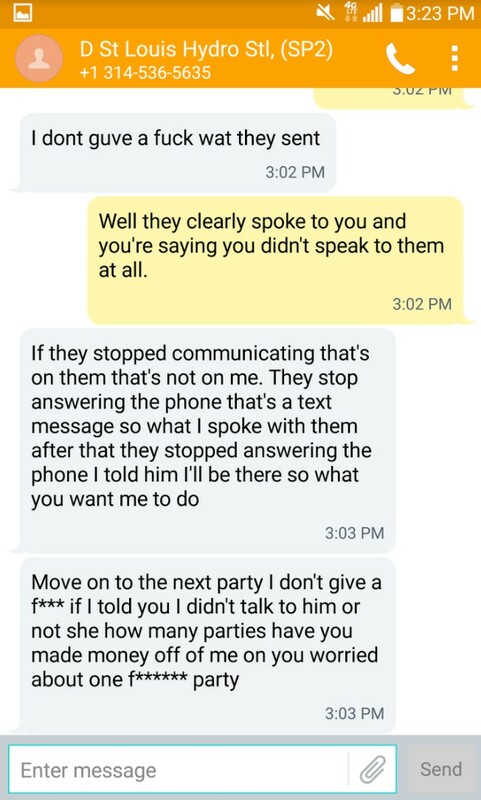 He called again and stated that he wouldn’t be able to come until 1am and asked if we could pack up the bachelorette party and take it to someone house which wasn’t an option. I asked him can he send someone else and he said he would call back after asking around. 10mins passed and he still hadn’t called so I called him and he said no one else can come and that he would have to change the time again to 1:30am. I asked him which number is he on the list of the dancers and he stated he doesn’t have a number on the website and the website is not legit. He said he doesn’t know why numbers are on there and that he is not even on the list. He said if he can come at 1:30am then he will allow us to pay him less but he said the deposit is not his so he doesn’t control what happens with the deposit. I texted him and said we only have one more hour to be at this building before we have to leave and asked him is he pulling up because at that time is was 1:15am and he said please go to someone house. I advised him we booked him to come at the latest 11:45 and he has changed his time several times which is very unacceptable and I advised him that this is unprofessional and he is not even the dancer we booked and he gave the website a bad name. He said okay and I advised him we must leave the building. The entire bachelorette party had left at 1:30 besides myself and the guest of honor. It was 23 Women there and only 4 left by 1:30am and still no Hydro. AGENT: WOW! This is completely unacceptable and in no way a refection of the way we do business. I have issued your refund and I will deal with this bad egg accordingly. He was in no way forthcoming with us about the circumstances that night. I am so sorry! I am also extending you a $50 credit to use any time in the future. CLIENT: Thank you I appreciate that. I told him that is no way to represent a company. If you want I can still send you screenshots of when we spoke with him and for how long. I couldn’t believe how non chalant he was and also that he said he had a more important show that he wanted to attend. The guest of honor is getting married on 10/07/2017 and wants another bachelorette party which unfortunately can’t happen. It was a horrible night and so much time wasted. He said we must speak with the company about the deposit because it doesn’t go to him. To be honest, the special guest of honor didn’t want Hydro from the very beginning because he gets booked for a lot of the St. Louis events so it was a disappointment when he told me his name but even then he made it seem like we had no choice so we accepted it. After he changed his arrival time 3x at that point we figured he isn’t going to come. He said he made $1000 at the show he went too and didn’t want to come to the event I booked because that show was more important to him. AGENT: I cannot believe this and that he thought he would get away with the lies. I am sooo sorry.